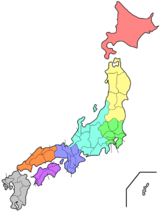 Ibaraki Prefectur (茨城県, Ibaraki-ken) is a prefectur o Japan, locatit in the Kantō region on the main island o Honshu. The caipital is Mito. ↑ Nussbaum, Louis-Frédéric. (2005). "Ibaraki-ken" in Japan Encyclopedia, p. 367 at Google Books; "Kantō" in p. 479 at Google Books. ↑ Nussbaum, "Mito" at p. 642 at Google Books. This page wis last eeditit on 8 Mairch 2018, at 04:46.